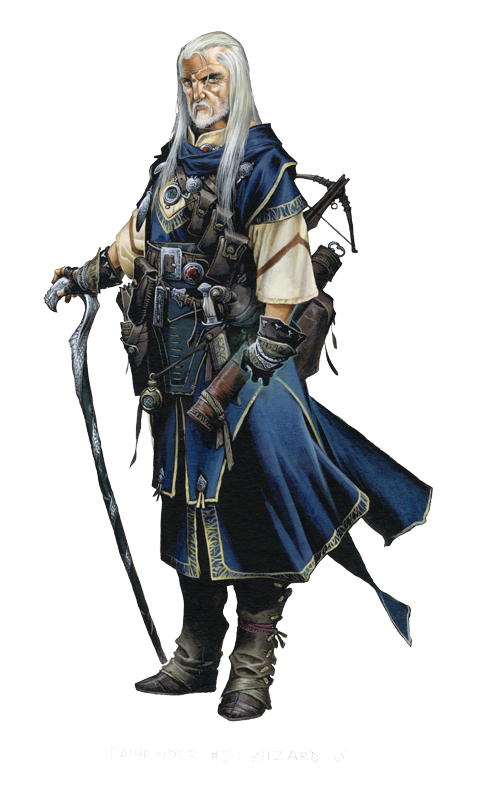 After years of trying to clear his father's name, Ezren abandoned his old life and became a wizard after his of research revealed that his father was indeed guilty of heresy. Ezren is a middle-aged man, and he has the ability score modifiers for that age category. Before Combat Ezren casts mage armor and shield before the start of the encounter. Given the time, he also casts fly and greater invisibility. During Combat Ezren uses his attack spells in conjunction with his hand of the apprentice special attack to eliminate threats against him and his companions. Without mage armor and shield, Ezren's statistics are AC 16, touch 14, flat-footed 14. Born to a successful merchant in Absalom, Ezren spent his childhood in comfort and safety, only to have all that change when his father was charged with heresy against the god Abadar. Ezren spent much of his adult life attempting to prove his father's innocence, only to finally confirm his father's guilt. The revelation shook Ezren to the core, undermining his faith in family and church, and he abandoned both, setting out to find a new life. Despite his age, Ezren embraced arcane studies, a pursuit that swiftly revealed a true aptitude for the wizardly arts. With freedom and potency he's never enjoyed before, Ezren seeks to explore the world he so long neglected.